Our chocolate lab, Ella Fitzgerald, woke me up this morning at 5:00am with my bathing suit in her mouth. Sparkling in the night light was Ella's new Mod-Dog ID tag. Mod-Dog artist Kari handcrafted this custom pet ID tag for Ella and I really love the quality and unique design. 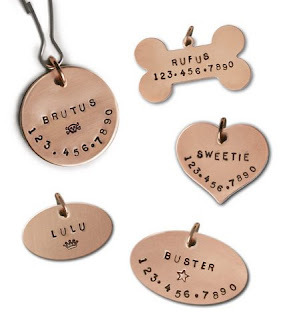 The custom tags are available from Mod-Dog in sterling silver or copper. 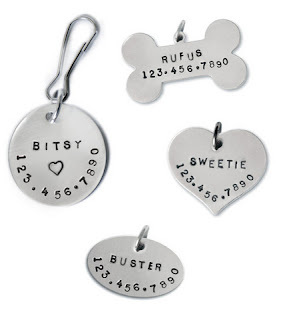 They are hand stamped with your dog's name and telephone number and a design of your choice. You can choose between a dog paw, heart, skull and crossbones, star or peace sign. Ella's tag is stamped with a heart because who can resist those brown eyes. Thanks to the good people at Mod-Dog, we have a Sweet Dog GIVEAWAY! One lucky winner will receive your choice of a silver or cooper Pet ID tag stamped with your Sweet Dog's name and phone number. Winner will be selected at random. Contest winner must have US shipping address. Contest Ends 04/24/09. This contest has ended. 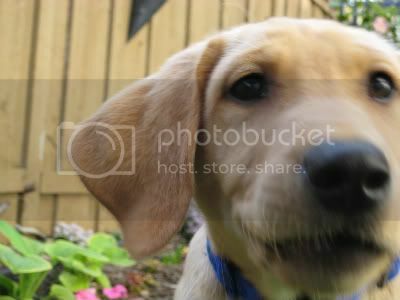 Thank you to all the dog lovers who visited our site and entered the contest. Congratulations to our winner, Danetta.